Despite being roughed up and beaten a few days prior to Christmas by home invaders who made off with his World Series of Poker (WSOP) championship gold bracelet, Jonathan Duhamel has started off the New Year on an incredible winning streak by reaching four final tables out of five events entered at the 2012 PokerStars Caribbean Adventure (PCA). His most recent payday was a runner-up finish worth $634,000 in the PCA’s scheduled finale, the $25,000 High Roller Event held at Paradise Island’s Atlantis Resort. First place went to Ukraine’s Leonid Bilokur, who took home $1.1 million for winning the tournament that saw a final table packed with well-known online poker players. Randy “nanonoko” Lew, who set a world record just a few days ago by playing 23,493 online poker hands in an eight-hour period and coming away with a profit, finished in eighth place and pocketed $108,780. That’s $108,772.35 more than his $7.65 winnings in the marathon record-setting achievement in which the multi-tabling expert played between 35 and 40 tables simultaneously for most of the eight-hour duration. 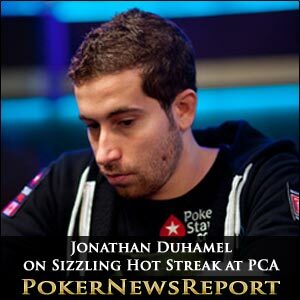 Duhamel’s other final table cashes at this year’s PCA include fourth place in a $100,000 entry fee Super High Roller Event that increased his 2012 earnings by $313,000. A No-Limit Hold’em Turbo tourney costing $5,000 was good for another $17,990 on a fifth place finish. Duhamel took the first-place crown and $239,830, outlasting a field of 158 players in the $5,000 No-Limit Hold’em Eight-Max tournament. In winning the eight-max event, Duhamel beat fellow countryman Edward Kim in heads-up play. Other final tablers at that tournament included Jason Mercier and 2011 WSOP Main Event champion Pius Heinz. The 2010 WSOP Main Event winner, Duhamel was attacked and robbed in his Canadian home at 9:15 in the morning just days before Christmas. In addition to his WSOP bling, the miscreants made off with a Rolex watch given to him by PokerStars in commemoration of the event and more than $115,000 in cash. Duhamel was treated and released at a local hospital after being tied-up and assaulted during the home invasion. Four people were eventually charged in the crime. Duhamel’s decision-making process on selecting what cards to play is obviously better than his choices on what young ladies to date, as one of the perpetrators charged in the home invasion is allegedly an ex-girlfriend of the Canadian pro. Bianca Rojas-Latraverse, 20, who was previously romantically involved with the 24-year-old poker star and reportedly lived with Duhamel for five months last year, was arrested in the attack. Along with Rojas-Latraverse, Andre-Robert Perron, Anthony Bourque and John-Stephan Clark-Lemay were also charged for their involvement in the brazen attack. Perron was said to be wearing Duhamel’s Rolex watch upon his arrest. Rojas-Latraverse and Clark-Lemay have been denied bail and will remain jailed until the trial date. Bourque and Perron have been released on bail. All four alleged attackers are scheduled to return to court Feb. 21. While Duhamel’s Rolex has been recovered, his WSOP bracelet has not. Caesars officials have confirmed that the gold bracelet can be duplicated and replaced if need be. Duhamel earned $8.9 million for taking the WSOP Main Event title in 2010, besting a field of more than 7,300 players. With his recent hot streak at the PCA, Duhamel is climbing the all-time money winning list and is nearing the $11 million mark in live tournament cashes.